The diagram shows an incomplete eye in the center. 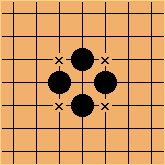 If White manages to occupy two (or more) of the corner points marked x, then this will normally become a false eye. The two diagrams below are examples of false eyes. Of course, this is an isolated, abstracted situation. Usually you cannot decide whether an eye is false or not just by looking at these points. 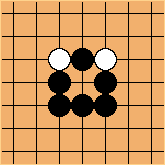 However, on the assumption that the White stones in these diagrams are alive, the eyes will very often be false. For a more detailed discussion on real eyes versus false eyes, please see the recognizing an eye page. More formal definitons are attempted at Formal Definitions of Eye. 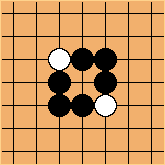 Teaching eyes to beginners discussion.